We are officially done with the first week of Lent. And I think we need to celebrate with cake. As much as I am obsessed with our chocolate Wacky Cake we make during Lent each year, I wanted to make another type of vegan cake. Because life is about options, right? To get inspiration, I usually stand in front of my pantry/fridge, see what I have to work with. During my search, I found that I had a bunch of apples in the fridge and a jar of applesauce in the pantry. I always have cinnamon and nutmeg in the spice cabinet, so I knew that I wanted to make a version of spiced apple cake. Oh, and to be fancy, I wanted to make it as an upside-down cake because you have to celebrate the little victories in life! (any being vegetarian/vegan for a week without cheating is a victory for me!). This apple cake delivers all the flavor of a traditional spice cake with a dairy-free, egg-free twist. 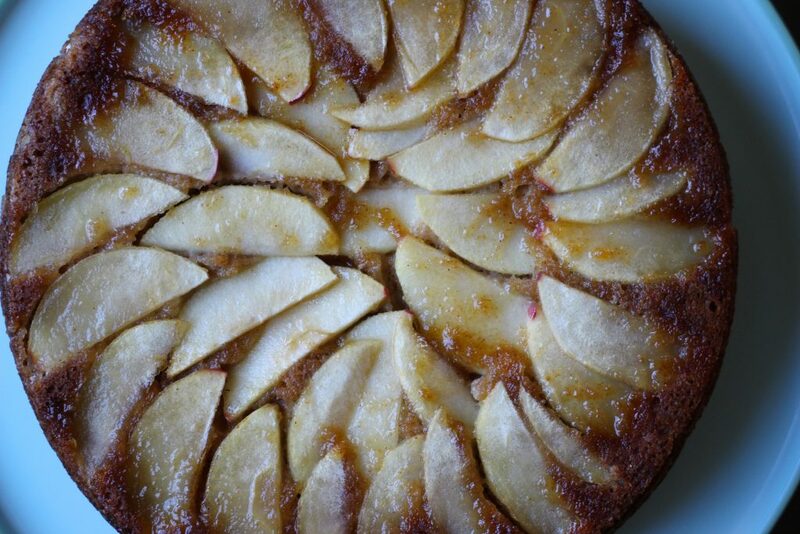 This apple cake starts with the pan. Liberally spray a springform pan (with a detachable bottom) with cooking spray and sprinkle over two tablespoons of brown sugar on the bottom. Then layer thin slices of apple on the bottom of the pan. Set the pan aside and assemble the cake batter. 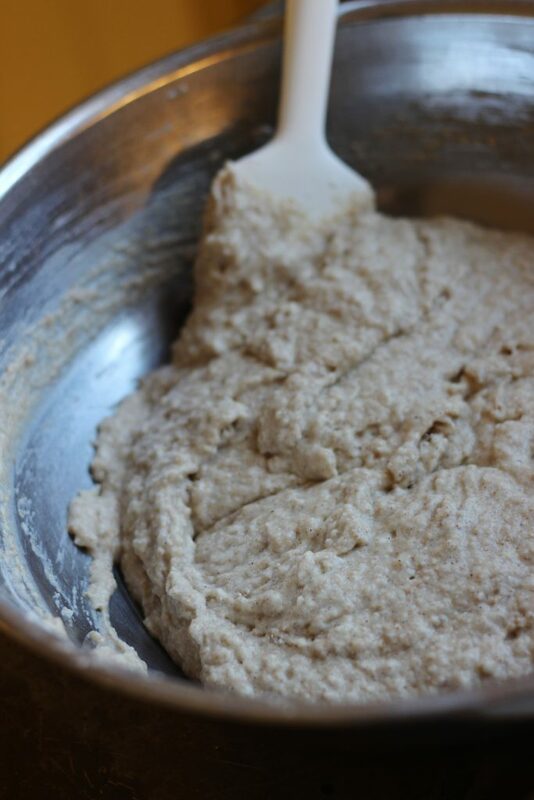 In a small bowl, combine whole wheat flour, all-purpose flour, baking soda, salt, cinnamon, and nutmeg. Whisk to combine. Then in a large bowl, combine granulated sugar, unsweetened applesauce, white vinegar, and vanilla. Stir to combine and then forget to take a picture (whoops!). Add the dry ingredients to the wet ingredients and gently stir to combine. Pour the batter over then apples in the pan and then use a spatula to make sure the batter is even. Pop the cake into a preheated 350 degree oven and bake for 25-30 minutes until the cake is golden and the edges are pulling away from the sides of the pan. 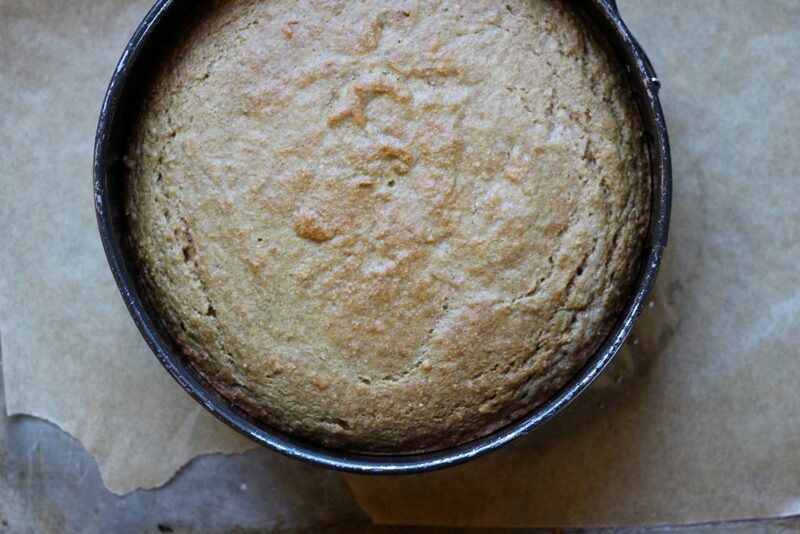 Remove the cake from the oven, allow to cool for 1-2 minutes, then carefully invert onto a dish. 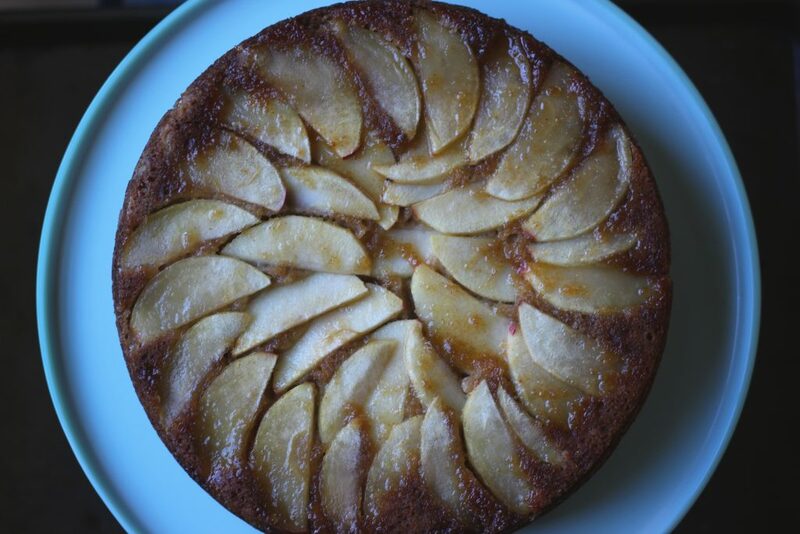 This apple cake tastes delicious as is, but would also be yummy with some whipped cream or ice cream (regular or vegan, your choice!). Definitely a new family favorite. So, how did the first week of Lent go for you? Simply A (RD) Fact: Apples are high in dietary fiber, which is important in digestive and heart health! Preheat your oven to 350 degrees. Liberally spray a springform pan (with a removable bottom) with cooking spray. 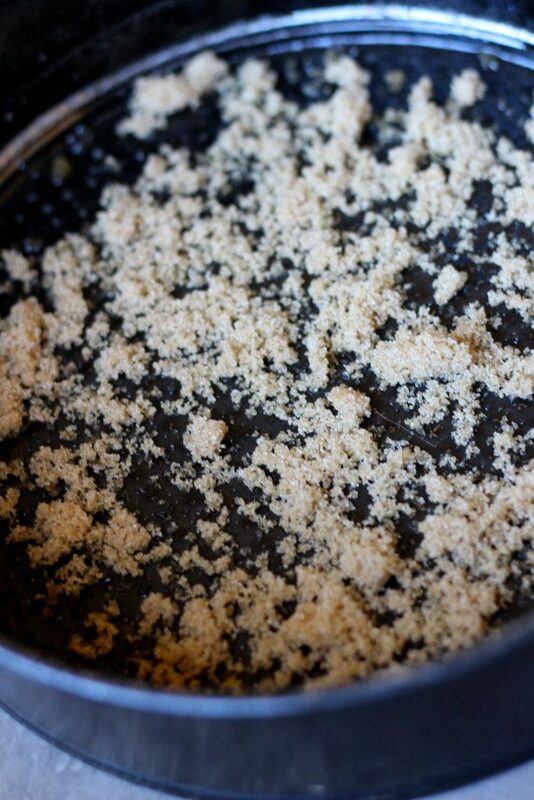 Sprinkle brown sugar over the bottom of the pan. 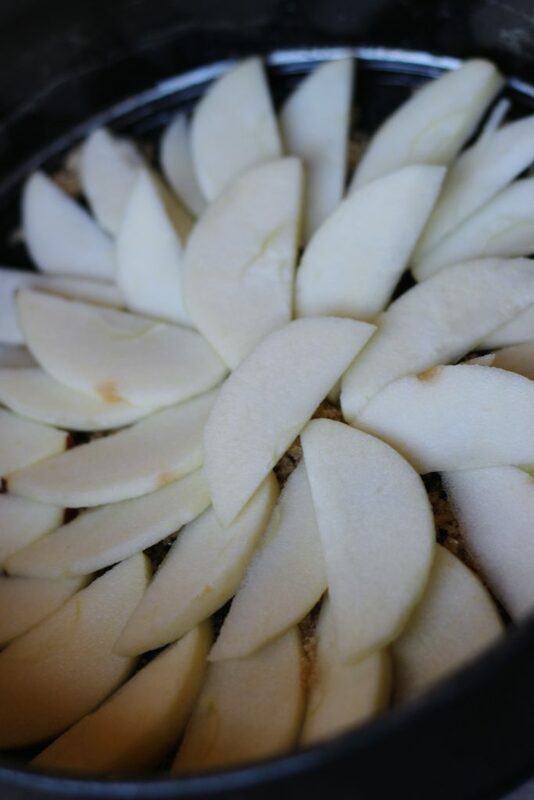 Layer apple slices over the brown sugar in a circular pattern. Set aside. 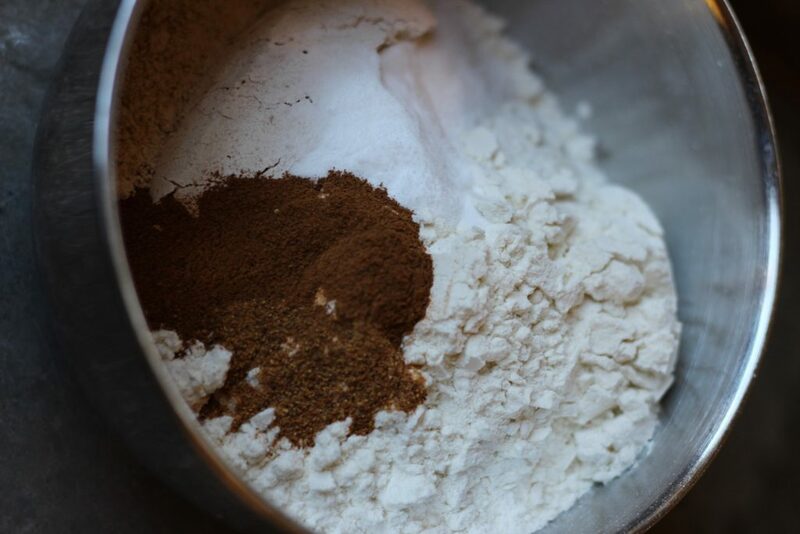 In a small bowl, combine whole wheat flour, all-purpose flour, baking soda, salt, cinnamon, and nutmeg. Whisk together and set aside. In a large bowl, combine sugar, applesauce, vegetable oil, vinegar, and vanilla. Stir to combine. Add dry ingredients to the wet ingredients and gently mix to combine. Pour the batter over the apples and use a spatula to make sure it's spread evenly. Bake the cake for 25-30 minutes or until golden brown.